Have you ever cherished a piece of jewelry and felt crushed when it got lost? I experienced that a year ago when my favorite leather wrap bracelet was accidently left behind while on vacation. I was thrilled to replace it recently with a new design, by jewelry designer Jane at Jane Jane Jewelry. Jane Jane Jewelry has a gorgeous collection of modern jewelry for women. Featuring sterling silver gemstone jewelry, my favorite leather wrap bracelets, switch snap snap-button jewelry and lampwork bead charm bracelets, Jane Jane Jewelry has a very special place in my jewelry collection. What I love most about her collection is that all of the pieces of jewelry are always such an exquisite quality and yet it is still very attractively priced. I always get so many compliments when I wear one of this designer’s leather wrap bracelets. Even my husband who doesn’t normally notice my jewelry compliments me when wearing one of these stylish bracelets. 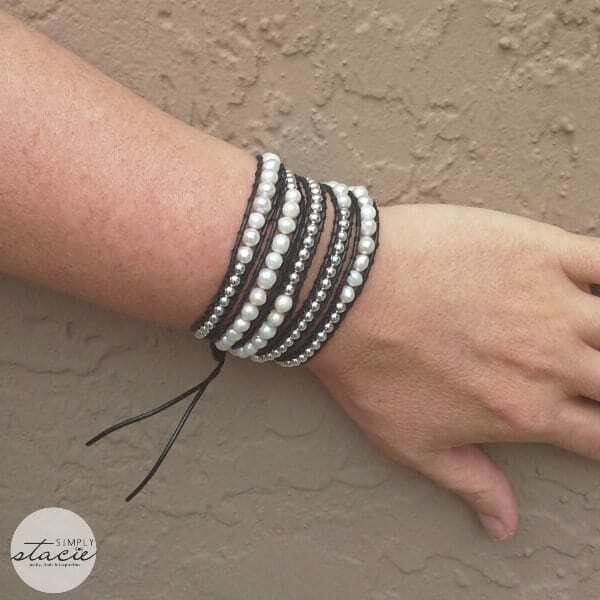 The Freshwater Pearls Beaded Black Leather Wrap Bracelet ($49) is absolutely stunning! It wraps luxuriously around the wrist up to five times thanks to the generous extra-long 39” length. The 4mm silver plated beads are alternated stunningly with gorgeous cultured white freshwater pearls and then both are highlighted by the black genuine-leather bracelet. The combination of beads, pearls and leather is so modern and pretty. I can wear this with a pretty black top and jeans and it looks just as nice when worn casually as it does with a dress. I appreciate that I can adjust the bracelet to the desired length because it has three loops to choose from when closing it with the silver tone button. What makes this bracelet extra special is the attention that the jewelry designer puts into each handcrafted piece….every single detail is perfect. It even comes in a nice organza drawstring bag which makes it ready for gift giving. However, I warn you to consider purchasing one for yourself too when you plan to give one as a gift because it is so pretty that you won’t want to give this leather wrap bracelet away! You are invited to visit Jane Jane Jewelry to purchase this pretty bracelet or browse the entire collection of leather bracelets in a variety of styles and colors. If you love high quality handcrafted designer jewelry that won’t break the budget then you are sure to find lots of fabulous pieces at Jane Jane Jewelry. These bracelets are perfect to give and to receive….which piece in the collection is your favorite? I love the Oval Rainbow Moonstone Gemstone Sterling Silver Bracelet. I LIked the artistic oval sterling silver braclet. Celtic Design Round Dangle Earrings 925 Sterling Silver … ooh!